Industrial Panel Solutions (IPS) partnered with a major engineering firm to provide control panel solutions for a large parcel delivery service’s airport package sorting facility. IPS worked with both the end user and the integrator to update the hardware, providing operators with new control consoles needed for the updated technologies being integrated. The panels that IPS replaced had been in this facility for the past 30 years. Naturally, it was time for the client to upgrade technologies and replace these aged components in their operation. With the considerable age of these panels, they were becoming a risk that could cause costly downtime. A malfunction causing any amount of downtime in this process could cause loads of back log and unacceptable delays in delivery. Late packages and deliveries are considered significant failures to this client who is known for their uber reliability. Obvious discoloration of the internal components and fading labeling were a clear sign of unanticipated downtime and difficult maintenance. 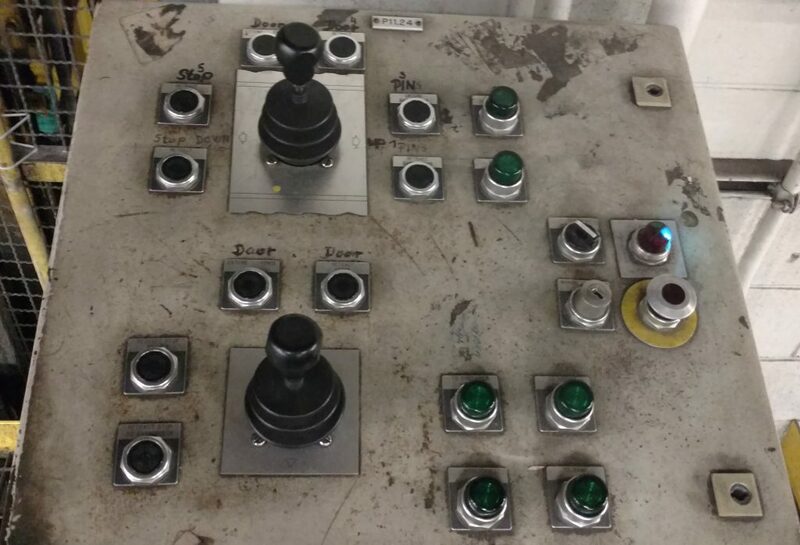 Operator push buttons and joysticks were nearing the end of their useful lives, causing a significant risk of downtime. Kudos to those who assembled these panels when Ronald Reagan was president, they seemed to have withstood the test of time and served their purpose well. At the request of our customer, the design of the new control panels was to be nearly identical to the existing. The main reasoning behind the similar design was to reduce the requirement for additional training and eliminate potential mistakes of operators who have been using these control centers for years, and in many cases, decades. In total there are eight different control panel types that we replicated for this project. Each panel controls a part of the bulk package loading, unloading, and transportation process. We don’t know who the president will be in 30 years, but we do know that you can count on our panels still being fully functional in this client’s facility.